“Oh! Sweet south wind! Oh! Wind Hygeian! “Oh! Wind of spiced and honeyed breath! “Up from the brooding depths of the Caribbean! Since moving to Port Aransas following World War I, Myra and George Brooks had been living the good life. They had a two-story bungalow with a wide veranda looking out on the bay, with the beaches of Mustang Island only a short distance away. When George wasn’t at work at the shipyard, the couple spent time in their boat fishing in the bay and Gulf, or riding horseback next to the breakers. But during the second week of September 1919, Myra began to feel uncomfortable. 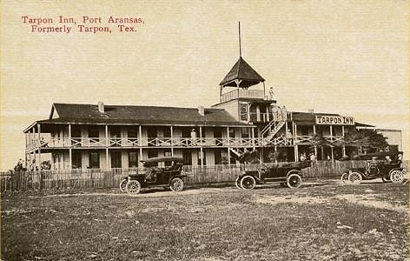 Myra told her husband that they should leave Port Aransas and stay on the mainland with friends for a while, but he would not leave the shipyard. And Myra would not leave him. On September 13, the tide ran unusually high and both the bay and the Gulf had grown rough. The wind began to pick up. The wind howled all night, only growing stronger. By dawn on the 14th, even though their house stood on six-foot piers, waves washed inside, covering the floor. Ships in the harbor had been blown ashore and the wharves and fish houses had disappeared. “We seemed to be alone in a roaring world of water and wind, and there was nothing we could do about it,” she remembered. With the storm still raging, Myra lit a candle so she could see to carry some of her family’s possessions into the attic. As it turned out, the candle saved the couple’s lives, along with her sister and sister-in-law. A Coast Guardsman saw the flickering flame and realized their house remained occupied. “He said we must leave at once for the sand hills (dunes),” she wrote. In 120-mile-an-hour wind with higher gusts, the guardsman led them to higher ground. At times, they had to swim. All the while, parts of roofs and large pieces of lumber flew past them and nails and cactus thorns tore their skin. Several times, Myra sank under the fast-moving water, exhausted. Each time, her husband pulled her up and said they had to keep going. Finally, they made it to the high dunes, but the water continued to rise, reaching within four feet of the couple and others who had taken refuge there before the wind turned and the Gulf began receding. At one point, the wind ripped a baby from its mother’s arms. Myra and George, along with everyone else who lived on Mustang Island, had lost everything – and many were dead. The 1919 storm (the government did not begin naming tropical cyclones until 1953) killed 287 people. A 16-foot storm surge heavily damaged nearby Corpus Christi and virtually destroyed Port Aransas. A long-standing myth that Corpus Christi stood immune from hurricanes had been violently destroyed. The Brooks family and other marooned on the sand dunes remained stranded until September 15, when the Coast Guard took the Port Aransas survivors across the bay to Aransas Pass. That town had also sustained heavy damage, including the loss of its business district. Friends whose home still stood took the badly battered couple in for several days until the military and Red Cross arrived. Myra wanted to be on the first refugee train out of town, but George had to stay and oversee salvage work at the shipyard. The couple remained in the area until June 1920, when George resigned and they returned to the Northeast. In the early 1930s, Myra penned her recollections of the storm, along with a poem she called “The Hurricane of Death.” But her account and other written memories did not see print until 2012 when her half-niece published her works in book form.